Bearing construction is a key difference between vertical motors and horizontal motors that are mounted vertically. Vertical motors typically drive pumps using thrust bearings. Horizontal motors rarely have those types of bearings. 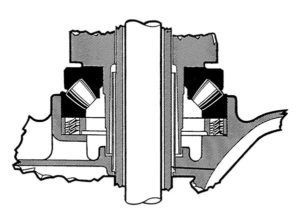 Understanding relevant construction and configuration factors is crucial when confronting lubrication-related issues that can be associated with vertical-motor bearings. Vertical motors commonly have a thrust bearing and a guide bearing. The thrust bearing is usually at the top of the motor and may consist of one or more angular contact bearings, a spherical roller bearing, or a hydrodynamic plate bearing. 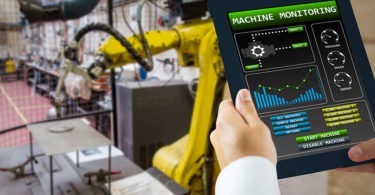 The force and direction (upward, downward, or balanced) of the applied axial load dictate the type and number of thrust bearings needed to obtain optimum performance and service life. Fig. 1 at the top of the page shows a typical vertical motor with the thrust bearings at the top. 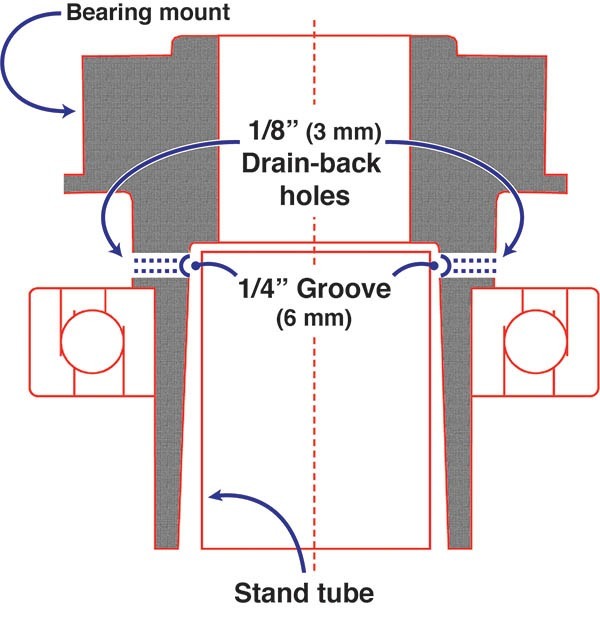 If the upper bracket and bearing in the illustration were replaced with a Conrad deep-groove ball bearing, the motor would look very similar to a horizontal motor. The bearing opposite the thrust bearing (usually the lower one) is called a guide bearing (Fig. 2). 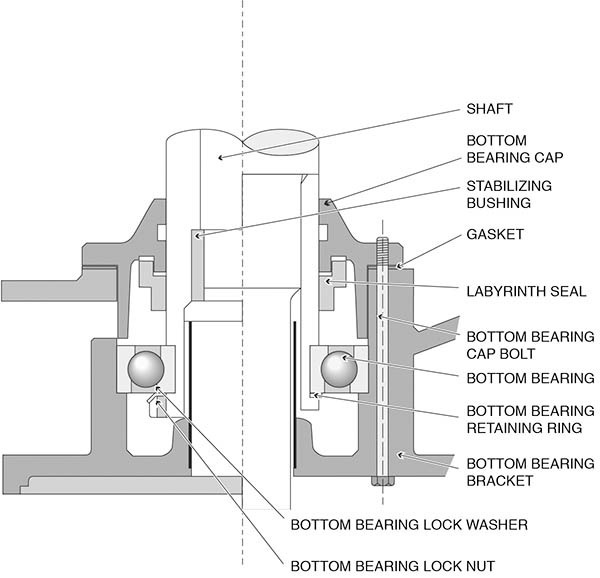 Typically a Conrad bearing, this guide bearing locates the lower end of the motor shaft. It’s often grease-lubricated, even though the load of the thrust bearing requires oil lubrication. Although the guide bearing has little or no load applied under normal operation, it may be called upon to handle momentary thrust in the direction opposite the thrust bearing (upthrust). Momentary thrust is defined as no more than 30% of standard high thrust for no more than 10 seconds. Vertical motors are classified as normal thrust, in-line thrust, or high thrust. Normal thrust loads can be determined from tables based on the motor’s speed and horsepower rating. 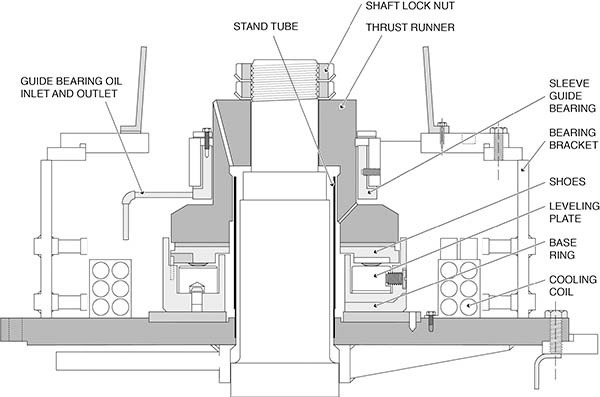 High thrust is a multiple of normal thrust, such as 175%, 250%, and 300%. Angular-contact ball bearings are the most common types of thrust bearings. A single bearing is used for normal thrust loads; two bearings in tandem (Fig. 3) for 175% of normal thrust (placing two bearings in tandem does not double the thrust capacity); and a stack of three bearings for 250% of normal thrust (see table above). Stacks of as many as five bearings have been reported. Spherical roller bearings (Fig. 4) are used when even higher thrust loads are applied, such as in very deep wells where the weight of the water column, the pump shaft, the impeller, and the force of moving the water can be several thousand pounds. Spherical roller bearings can handle 300% to 500% of normal thrust load. A hydrodynamic bearing, also known as a tilting-pad, plate, or Kingsbury bearing (Fig. 5), is capable of extremely high thrust loads and very long life. As with sleeve bearings in horizontal motors, there is theoretically no wear on the plates because the load is carried on an oil film that separates the moving parts. 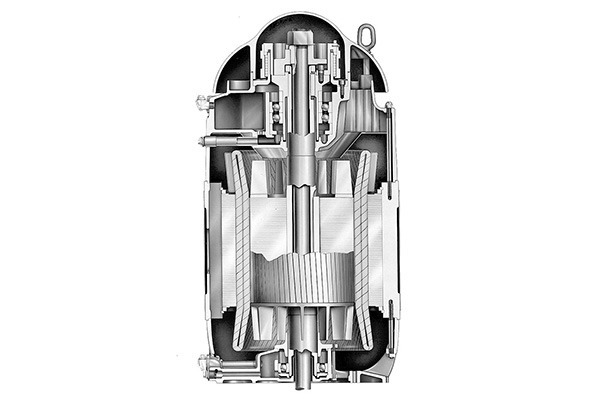 Occasionally, pump designs will exceed the momentary up-thrust limits (more common on two-pole [3,000/3,600 rpm] applications), and the guide bearing cannot accommodate that thrust for the necessary duration. In such cases, the upper bearings are arranged face-to-face or back-to-back. 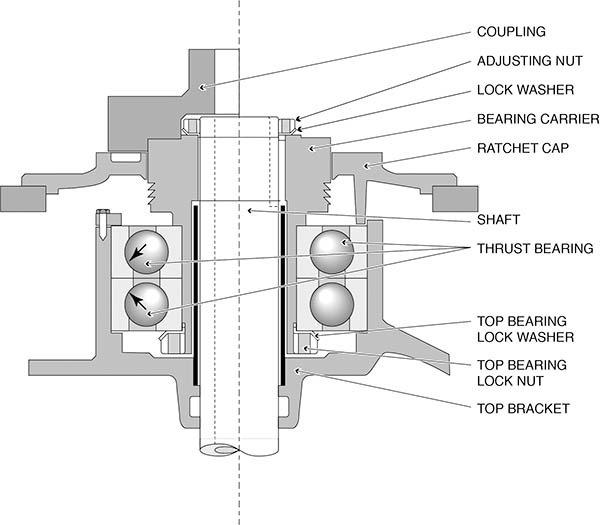 Note that with back-to-back bearings thrust transmission is in opposite directions (see arrows in Fig. 6). This configuration also requires additional parts. 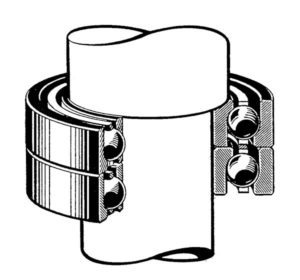 A hold-down ring, for example, must be located on the outer race of the upper bearing and fastened to the upper bracket to prevent the up-thrust from lifting the bearings from the bearing bore. A nut or a spiral-lock snap ring must also be applied to the bearing carrier below the lower bearing inner race to prevent the up-thrust from pushing the bearings off the mount. • When disassembling a leaky vertical motor, carefully inspect the space between the shaft and the inside of the stand tube. Oil observed in this area narrows the scope of the investigation, because the oil must go over the stand tube to get there. Leaks of this type are often caused by overfilling the reservoir or by the sloshing action that results from moving the motor with oil in the reservoir. 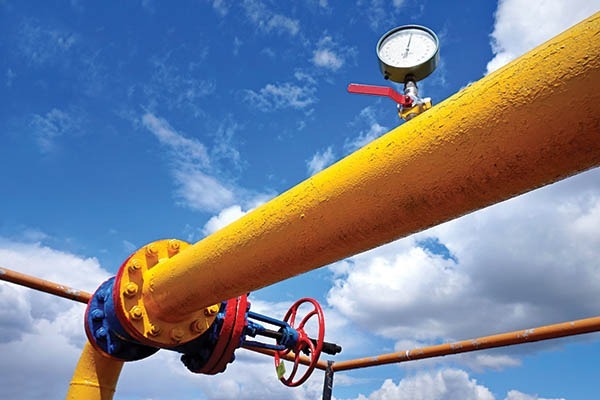 If the motor base is out of level by more than a degree, the oil-level indication in the sight glass will be inaccurate and could cause the oil to be above the stand tube. • If there’s no oil between the shaft and the inside of the stand tube, make sure the stand tube and oil sight glass are tight and secure. Before cleaning the bracket, check the bottom side for oil that has collected near potential cracks. Whether or not any oil is found, steam clean the bracket and place it on a clean sheet of kraft paper. Fill the reservoir with light oil or another liquid that will seep through any cracks, being careful not to use water or a solvent that could later contaminate the oil. Leave the bracket in that state for several hours and then carefully lift it to examine the paper for evidence of leaks. Some cracks will only open when the motor is at operating temperature. If the paper is still clean after several hours, place the bracket in an oven on clean kraft paper and fill the reservoir with light oil. Heat at 212 F (100 C) for several hours before checking the paper for signs of leaks. Cracks can be repaired by grinding a V-notch, drill-stopping the crack, and welding with nickel rods. More information about this procedure can be found in EASA’s manual, Mechanical Repair Fundamentals of Electric Motors, 2nd edition. Small cracks may be sealed by sandblasting and thoroughly cleaning the oil reservoir, then applying a high-grade, oil-resistant epoxy paint. If no cracks are found and the reservoir is still leaking, it may be necessary to replace the bracket. • Water in the oil in the form of condensation will displace the lubricant, raising the level above the top of the stand tube. In very humid environments, where the motor is idle part of the time, oil sump heaters will help prevent condensation. • Foaming due to contaminants such as water or solvents will also raise the oil level, but this shouldn’t be confused with the air bubbles that form normally as the bearings churn the oil. Air bubbles will disappear rapidly when the motor is stopped. Foaming caused by water or solvents will linger much longer. If flushing the oil and replacing it with clean new oil does not correct the problem, adding about an ounce of an anti-foam agent, such as silicone oil, will stop the foaming. Jim Bryan is a technical-support specialist at the Electrical Apparatus Service Association (EASA), St. Louis. EASA is an international trade association of 1,850 companies in nearly 70 countries that sell and service electromechanical apparatus. 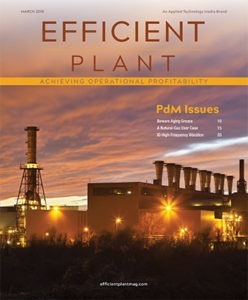 For more information, visit easa.com.